Cut spinach and make a paste. Take wheat flour. Add salt, pepper powder, ginger-green chillies paste, spinach paste and mix it properly. Add 2 tsp of oil and knead the dough. Add water only if needed. Make small balls and roll parathas. Cook it on tawa smearing it with oil on both the sides. 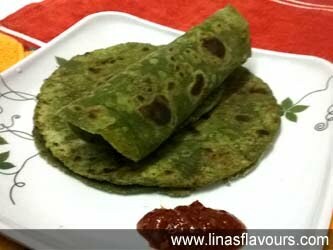 Green parathas look good and attracts children to eat healthy and nutritious food. Serve it hot it vegetable raita or chutney.